Facebook is the No.1 Social Media and about billions of people were registered with them , So using Facebook Webmasters can easily obtain traffic to their sites . There is lot of ways to generate traffic from Facebook , By creating Like pages , By creating advertisement , By chatting with friends etc . But here on this topic you will learn about "Facebook Friends Invite Button For My Website Using API" . By using the Facebook Friends Invite button your visitors can invite their Facebook friends to your website or blog easily . To create a Facebook Friends Invite Button you need to create a API Application in your Facebook A/c for that you need to click the following address and create one Facebook API by following the rules given below on this text . Click on the "Create Button" . On the "Display Name" Write your App name or your Website name . On the "Name Space" write anything specific for your App for identification , Or avoid it . Select "Category" To" Communication" . Click on the "Create App" Button . Facebook Developers Must Disable Sand-Box Mode to Active the App . After creating an App you need to configure your Facebook App settings like the following image display below . Update:- Click on the "Add Platform" Button for adding slab "Website" and "Facebook Canvas" . App_ID = App_ID will be automatically generated . Display Name = Use any Display name for your application . App Domain = Use your site address . Contact Email Address = Use your Facebook contact email address . Canvas Url = Your site address with example : http://www.yoursite.com/ url address must end with "/" . Secure Canvas Url = Your site address example : https://www.yoursite.com/ url address must end with "/" . 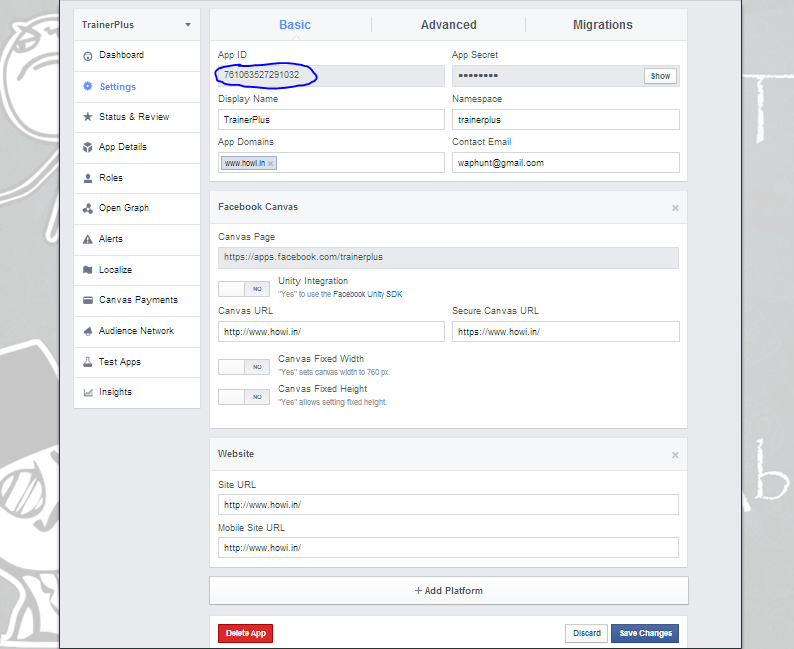 After creating the Facebook API Application you need to step up to the next stage . Copy down the following script into your webpage and change the " APP_ID" With your Application ID .